Mrs. G and I don’t cook many breakfasts on the Egg. Not that we couldn’t, but we tend to have different morning schedules. I get up earlier and let the dogs out, maybe grab a quick bite to eat. Mrs. G likes to sleep in. Rarely do we get up around the same time and cook breakfast, and when we do, we generally don’t feel like firing up the Egg. This past weekend was the Plano Outlaw Eggfest. The second year for us cooking at it, and we really wanted to start off the day with a breakfast item. So we racked out brains and tried to come up with a good idea. We found a recipe that sounded good to us, but we thought we’d put a Mexican twist on it and ended up with Mexican Breakfast Pizzas. 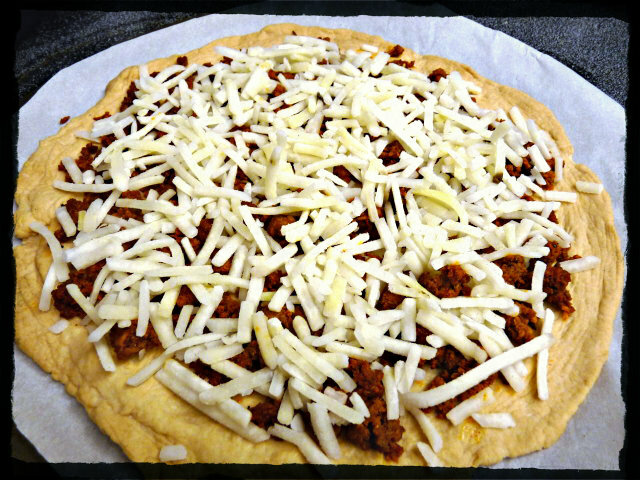 Rolled out dough topped with Mexican chorizo. Preheat your Egg (or oven) to 425 with your pizza stone inside. Remove chorizo from casings and fry up in a medium skillet over medium heat, drain grease and set aside. 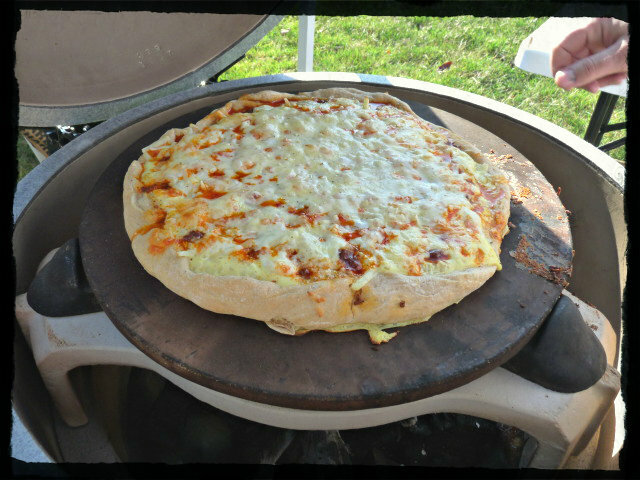 Roll out your pizza dough, making sure to create a lip on the edge to prevent the eggs from leaking out later. 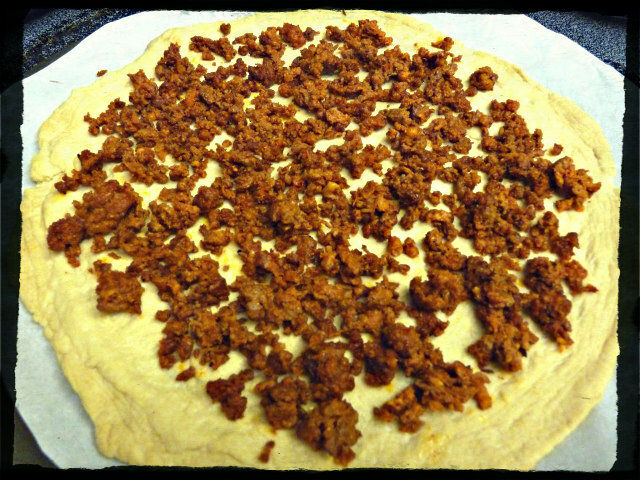 Top pizza dough with chorizo. Scramble your eggs and add milk and salt and pepper. 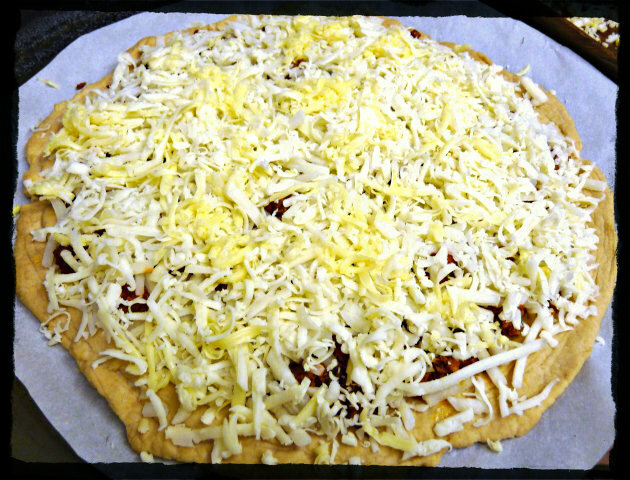 Slowly drizzle on top of the pizza making sure to evenly cover the entire pizza. 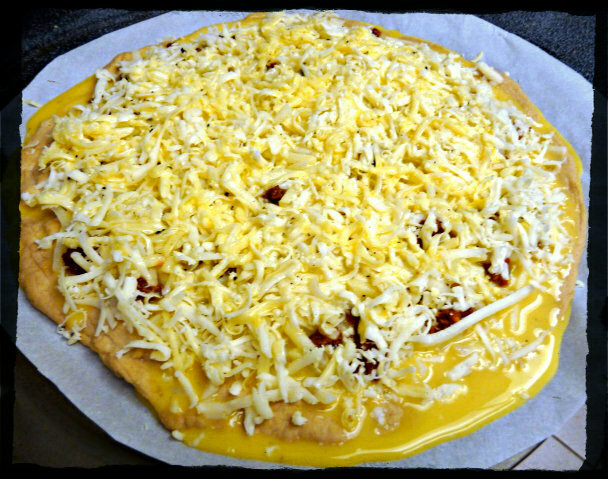 You may not need the whole egg mixture depending on the size of your pizza. If it begins to leak out the side, you have probably added enough. This is what happens if you don’t build a good lip on the edge of your dough. Don’t do this. Bake at 425, for about 12-15 minutes. Make sure to check on your pizza and spin occasionally to make sure it cooks evenly. So we cooked this Mexican Breakfast Pizza twice in one week. Once as a trial run and Mrs. G and I thought it was a hit. 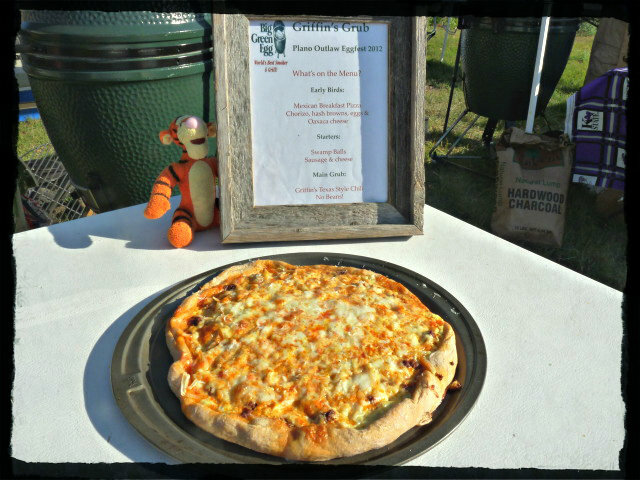 We cooked it again for the Eggfest, and either people were really starving or they agreed with us as it disappeared in under 5 minutes. Chorizo and eggs and cheese are always such a great pairing, they are just made to go together. Throw in some hashbrowns and pizza dough and how could you go wrong? 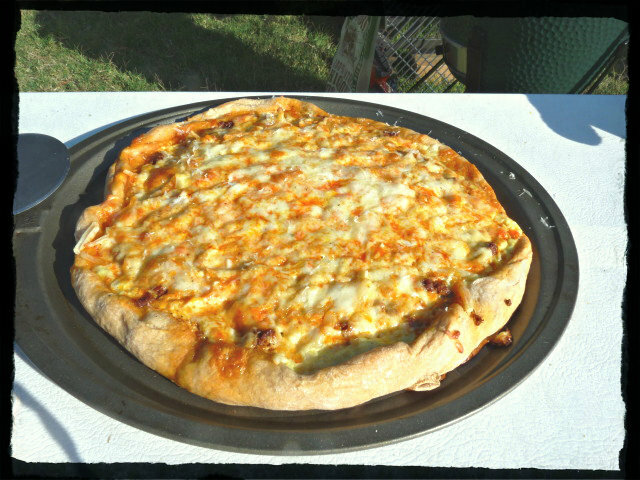 If you are looking for new ideas for a breakfast item, I suggest making this pizza. I think it would be a great brunch item as well. Thank you. First for us, but won’t be the last. Great looking pie, this could go for any meal or snack, Could see this with our favorite Sangria as brunch. Thanks! You make the sangria and I’ll cook the pizza for you! A truely stunning creation and i love the egg issue which you seem to have rectified?! We did breakfast pizzas this year where we cracked and egg onto them but I had the problem of my yolk not being done enough. 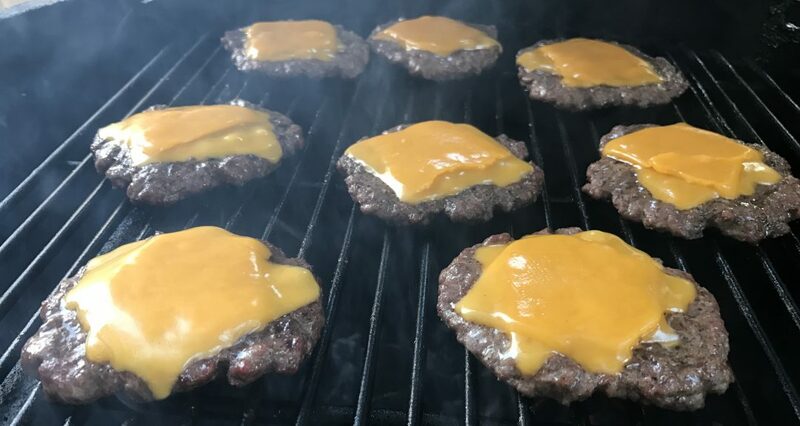 We did them at high heat and 4 minutes wasn’t quite long enough to cook to my liking. I suppose cooking at a lower temp for longer would have been the solution because our crust was done too fast. Looks awesome Jason! Hope you had fun at the fest! Thanks, Brian. I’ve been wanting to do a pizza with an egg cracked over it, just wasn’t sure how to go about it. Fest was a ton of fun, like they always are, but you know that. You put a bunch of really good ideas into this pizza, Jason. Robyn Lindars and I have told each other we are cooking an Eggfest next year. You mean Grill Grrrl? How cool is that? Any idea which one? I would love to be able to go see y’allin action.